The city of Lijiang is located in the northwestern corner of Yunnan Province, just southeast of the border with Tibet Autonomous Region (Tibet, for short). It belongs to roughly the same beautiful terrain as Shangri-La, located about 200 km (125 mi) northwest of Lijiang, the quasi mythical place described in the 1933 novel, Lost Horizon, by the British author James Hilton, which “paradise” was first described by the Austrian-American explorer, geographer, linguist and botanist, Joseph Francis Charles Rock (1884-1962) in a series of magazine articles published in the late 1920s in National Geographic. As is true for many quaint villages and small towns and cities in China, Lijiang is mystically beautiful. So while getting here might under ordinary circumstances be half of the fun, we suggest that you instead ‘cut to the chase’ and get to Lijiang by the quickest means at your disposal – we feel confident that you will never regret it! Lijiang’s Old Town is a UNESCO World Cultural Heritage site, its main ethnic minority being the Naxi, whose Dongba culture is also the main reason for the UNESCO recognition. 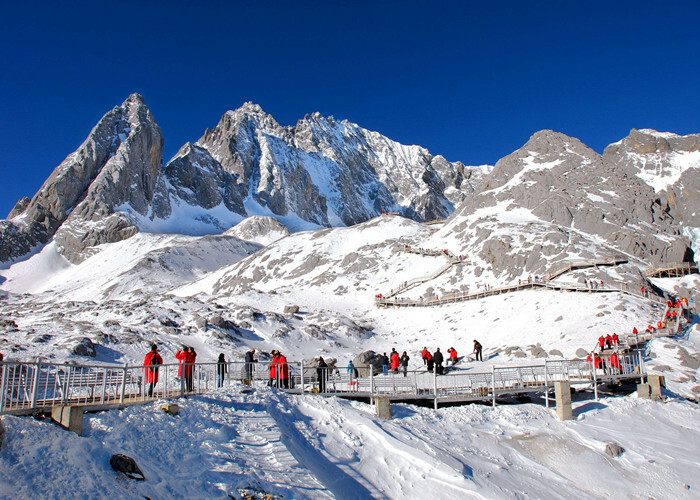 And if that is not enough, Jade Dragon Snow Mountain Ski Resort lies only about 15 km (9 mi) north of Lijiang. So what are you waiting for? Travel by air is naturally faster, and if you aren’t particularly interested in what lies between points A & B, but are pressed for time once you arrive in point B, then the airplane option is by far to be preferred. And, indeed, most foreign travelers have a list of must-see sites to visit at any particular tourist destination, therefore flying is generally their best option. Moreover, Lijiang is well worth the extra time spent in the city! 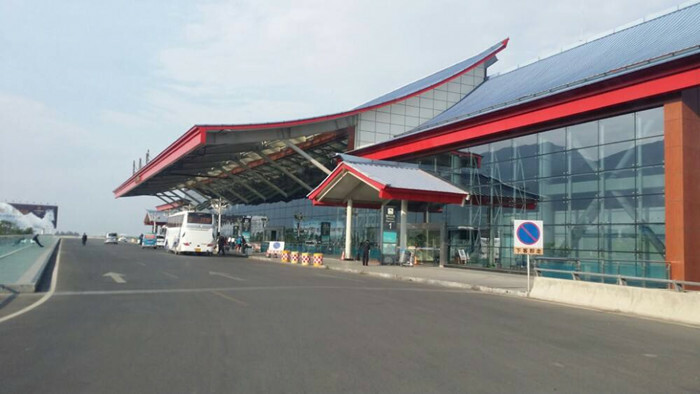 Lijiang Airport (LJG), which is located about 30 kilometers south of downtown Lijiang has direct connections to Kunming and Xishuangbanna – both located, like Lijiang, in Yunnan Province – and to Shanghai. From Shanghai and Kunming, Lijiang is connected to all of China as well as to the entire world, with Kunming providing connections to the rest of China in general – and to the region in particular – and with Shanghai providing connections to the other principal cities of China as well as to many major cities throughout Asia and beyond. The following table shows the regular routes to and from Lijiang. * Note also that Lijiang Airport also offers chartered airplane service. Reaching the airport from Lijiang, if you arrived in Lijiang by other means, or were not aware of the options when you arrived at Lijiang Airport, you can either take an airport shuttle bus that departs from the downtown area of Lijiang, or, you can take a taxi, which will of course be a bit more expensive. Airport inquiries: Tel (088) 8517-3081. On July 1, 2018, the Kunchu Grand Railway was officially opened to traffic, welcoming the start of the train. 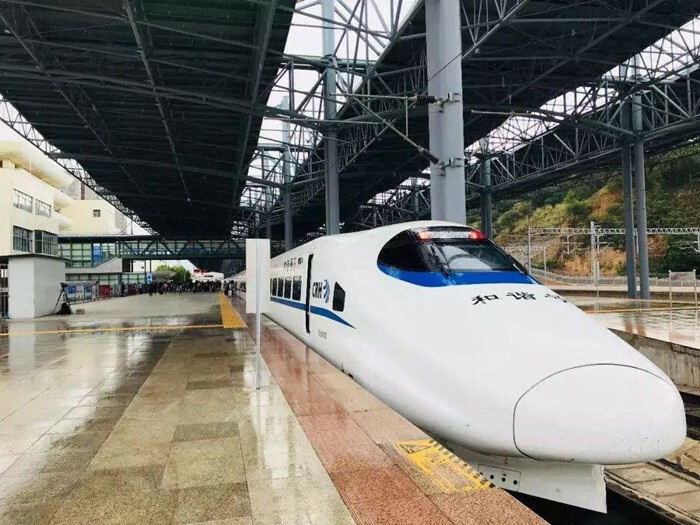 From Kunming to Dali, it will take within 2 hours; and the west of Dali, centered on Dali, was integrated into the national high-speed rail network. After the speeding up of the Dali-Lijiang railway, the train from Kunming to Lijiang EMU arrived in 3 hours. The train travelling to Lijiang has formed a convenient transportation service from Kunming 1 hour to Chuxiong, 2 hours to Dali and 3 hours to Lijiang. An extra argument for extending this train line to Lijiang is the close proximity of Jade Dragon Snow Mountain Ski Resort, about 15 km (9 mi) north of Lijiang. The Chinese long-distance bus has been the backbone of China’s rural transportation system for decades, and it is indeed a very well-developed transportation system that is both efficient, safe, and inexpensive. 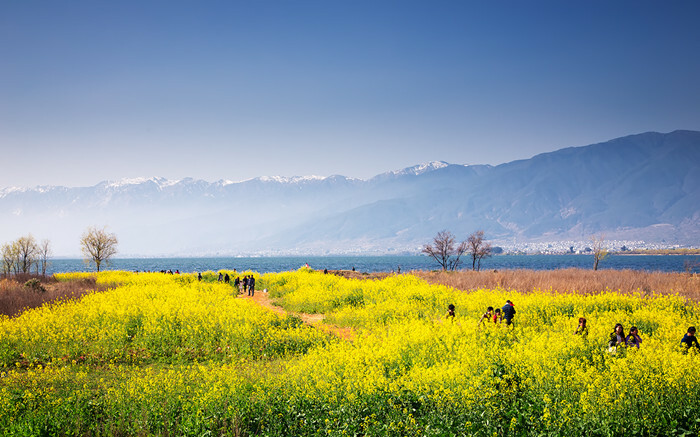 At present, if you are not prepared to fly into Lijiang from one of the above-mentioned links, then the only other options are by rented car or by long-distance bus. Lijiang has several such bus centers depending on the bus company. 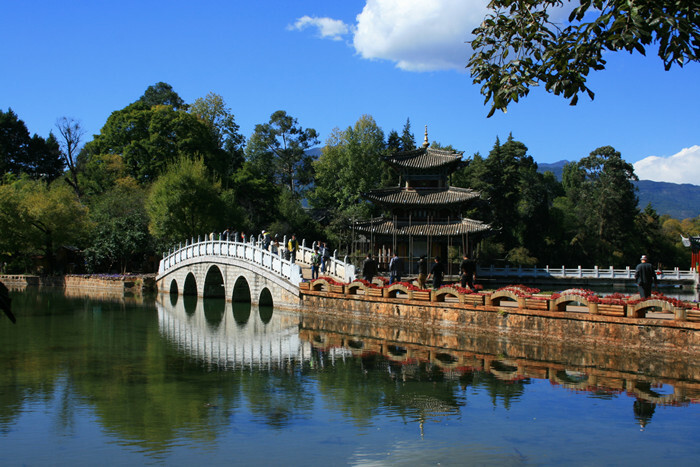 All of them serve the Kunming-Lijiang route, and many serve smaller, local cities, including Shangri-La to the northwest. The following inexhaustive list will offer several choices. Lijiang Tourism Bus Station, near to Naxi Hotel, on Changshui Road – there are buses to and from Kunming every hour, beginning from around 8 AM. The trip takes about 8 hours and costs roughly 155 Yuan. There are 5-6 night departures (i.e., sleeper coaches) too, beginning at around 6 PM. These take about 10 hours and cost slightly less, around 140 Yuan. 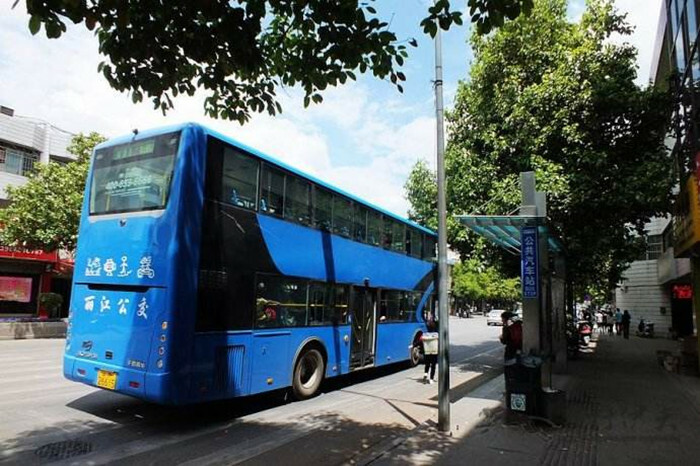 They also have three express buses to Kunming that all depart at staggered times during the morning, between 8 AM – 12 Noon. The fare is about 185 Yuan and takes around 7 hours. You can get to this long-distance bus station by taking either city bus No 1 or No 3. This seems to be the best and most well-organized bus service between Lijiang and Kunming – but hey, it’s in no one’s interest to see the competition disappear completely, eh? Lijiang Express Bus Station, Shangri-La Avenue – its buses serve mainly Kunming at the present time (check the operating schedule and the fares locally). Lijiang Guluwan Bus Station, near Heilongtan Park in the north of the Old Town – it has two main routes between Shangri-La and Kunming, one via Lijiang, Dali and Xiaguan, while the other is via Lijiang and Panzhihua, in Sichuan Province (check the operating schedule and the fares locally). There are 10 bus lines serving Lijiang proper and the immediate upland. All parts of Lijiang proper are covered by municipal bus except for Lijiang Old Town, where there is a city ordinance forbidding motorized transportation (Lijiang Old Town is a UNESCO World Cultural Heritage site, thanks to its Naxi ethnic minority who have preserved their unique Dongba culture… your rented bike (see below) will come in very handy here!). The bus fare varies between ½ to 1 Yuan (which is cheaper than shoe leather!). Bus No. 8 conveniently runs in a ring pattern around the outer perimeter of Lijiang, making inter-bus connections much easier. Since Jade Dragon Snow Mountain Ski Resort is only 15 km (9 mi) away, there is a daily bus departure, bus No. 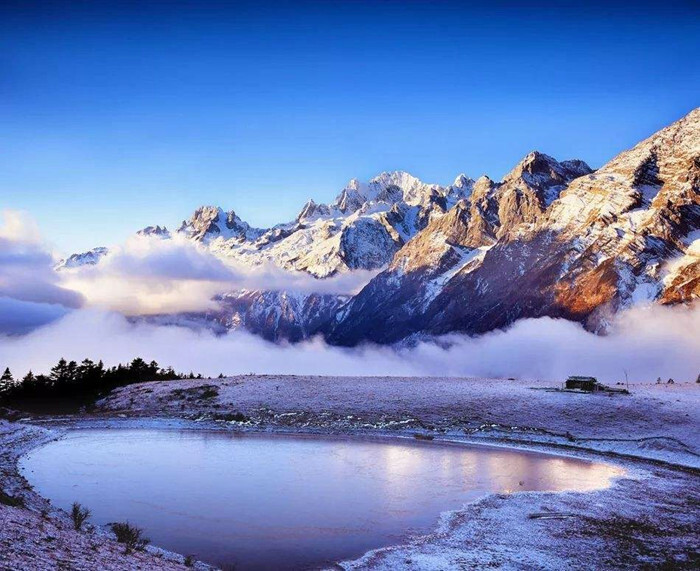 7 – in season, of course (the skiing season is from mid-Nov to early May) – from Hongtaiyang Square, located north of Lijiang Old Town. Despite is modest size, Lijiang has upward of a thousand taxis (! ), albeit, many of them are very small vehicles. The fares are extremely reasonable: 6 Yuan for the first 3 km (1.9 mi) for a smaller taxi and 7 Yuan for the first 3 km for a larger taxi. The price for an additional km (0.62 mi) is 1.6 and 1.8 Yuan, respectively. If you wish to take a longer trip by taxi, you can expect to be able to negotiate a more reasonable rate, provided that it is outside the peak tourist summertime season. An average trip within the city proper generally corresponds to the first 3-km rate listed above, and often taxi drivers don’t even bother turning on the meter for such short hops, which in reality amounts to a flat rate of 6 or 7 Yuan per short hop, depending on the size of the taxi. Note also that if you take a taxi after 10 PM, you will be charged a flat rate within the city proper of 10 Yuan. Riding a bike is the very best way to take in any place anywhere, were it not for steep hills, rocky, dirt roads and ferocious, pursuing dogs. While Lijiang does have some hills, it is not entirely characterized by hills, nor are dirt roads and threatening dogs a problem, so knock yourself out (i.e., go rent yourself a bike if you want to see the charm of Lijiang close-up). 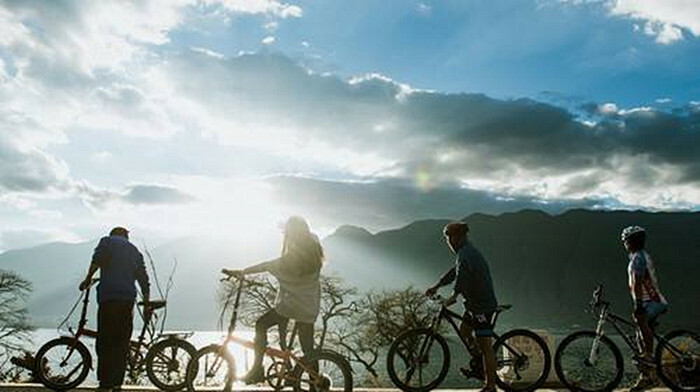 You can rent bikes at three places in Lijiang: at Red Sun Square; in Xenia Street (No. 70); and at the Youth Hotel, though the latter’s bikes are only available to the hotel’s guests (they might even offer a discount for this service, so you might want to check out the price of lodgings here first if you are thinking of renting a bike to do some sight-seeing in Lijiang).